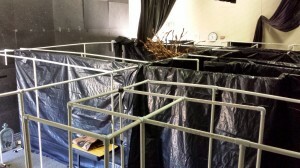 We began construction on the last day in September and were fortune that the school principal allowed us to layout the haunted house on the stage since the kids were out of school for 2 weeks. The project will only inconvenience music class for a few weeks. I rolled up to school about 9am and backed the truck up close to the auditorium and started unloading the material, which consisted of about 200 fittings and 1100′ of 3/4″ schedule 40 PVC pipe. Mark rolled up about 15 minutes later and by that time I had nearly finished laying out the entrance and Hall of Faces. He started working from the exit toward me. Unfortunately he didn’t even finish the Graveyard before we ran into a design flaw. The week prior I stopped by the school and measured the stage dimension but must have measured incorrectly. I had the staged planned as 24′ x 45′ but the TRUE dimensions were 24′ x 35′. We suddenly had to reduce the haunt by 10′, which was nearly the length of a room. Thankfully there was some “dead space” and “actor corridors” we were able to shrink or remove completely in order to keep the layout unchanged with the exception of the Inkblot Room. That haunt now turns into an Inkblot Hallway. It seemed to be the simplest fix to the problem, leaving in tact all the other portions of the haunted house. We spent another 30 minutes working on a redesign and discussing our options and what other possibilities we could explore. As we started layout of the PVC to mark off hallways and rooms my first impression was that 2 foot corridors are too narrow. Remembering our target audience, kids from kindergarten to 5th grade, this size corridor might work, but for adults it’s going to be very narrow. 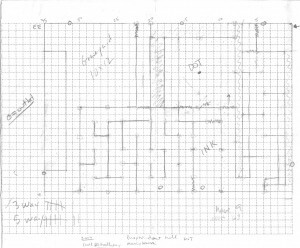 Once we had all the pipe laid out on the floor we looked over the entire haunt, both of us having a feeling there would be more changes on the fly as we started building the haunt. At look at the Labyrinth told us space would be at a premium and we might have to make further changes as we started erecting the PVC that would be the basis of our frame. Starting at the entrance we began connecting pipe and raising walls. There was some concern the 3/4″ PVC would not be sturdy enough, but we did brace the PVC on the walls. 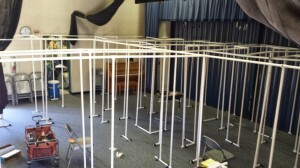 The more PVC we connected and walls that went up, the more sturdy the frame became. We probably spent too long on the construction of the frame, which took the better part of 3 week, including every day for the first 2 weeks of October for about 4-5 hours a day. It was slow going, but we made progress daily. We had to measure and cut all the pipe and we started to see the start of our haunted house. I had underestimated the amount of PVC needed and had to make another trip to Lowe’s for a few more bundles of PVC. Our walls ended up being 7′ high, something we will reexamine next year, as we ran into one problem. There was no horizontal run longer than 5′ without being braced vertically. There were also some areas, for example the Labyrinth, which required more bracing in order to be free standing. We also include horizontal bracing above some hallways to maintain the 2′ hallway we had planned. The Labyrinth. Great idea, poor execution. The original plan would have seen 3′ hallways and an actor that could chase guests. 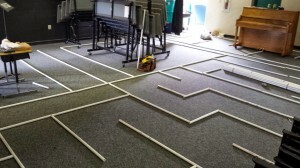 Unfortunately the original idea had to be modified and the corridors in the labyrinth became very tight. There was an idea to add fluorescent paint to the hallway walls, but after spraying a multi-directional arrow, that idea went out out the door, as the paint didn’t show up well at all. The narrow corridors made for a great feel, but due to the lack of space we had to work with made it made it a real challenge to provide a good scare. I never did walk through the final Labyrinth with actors in place. Once the frame was in place it was time to unroll the 4mm black plastic and start measuring and cutting to create our walls. Originally we wanted to cut as few pieces of plastic as possible, but it became evident this would be challenging after we hung out first piece that totaled 35′ long. There were very few areas that allowed us to hang long section of the walls. The plastic was 20′ wide, which required lots of cutting to fit the plastic vertically on the walls. Lots of waste or so it seemed as we sliced and diced and hung more plastic. 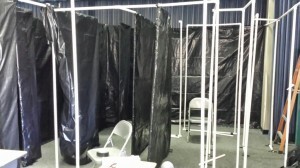 There were some doubts we could get the entire haunt done with just 2 rolls (200′ each) of black plastic. 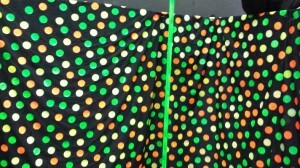 The only room that did not require black plastic was the Dot Room, which would be finished with black, flat sheets being hung from the PVC. This room worked out well as 3 of the walls had actor corridors. One thing we failed to notice that a single full sized sheet is 81″x96″, so it would have made better sense to make the vertical supports 8′ high for this room in order to let the sheets hang their full length. This was also the only room that had a horizontal support running the entire length across the room with a vertical component in the center of the room in order hang a black light. The use of the black plastic was cost effective, we only saved the unused plastic and recycled the rest, as there was no easy way to tear down all the plastic to keep the integrity unchanged. Three rolls of black duct tape later we had nearly finished the entire layout. Once the lights were out, the plastic worked well to keep light down in the areas we didn’t want it creeping into. There were times I wish we had wood walls, but that sort of construction wasn’t in the budget, which was shot by the time we had the frame raised and the plastic hung.